I've been enjoying the Milby blog ever since it was started, and I always look forward to logging in. It's great to read about former classmates - - their families, their achievements, etc. Each time I log in, I resolve to make some kind of contribution to the blog but, until now, have not carried through. Realizing my potential for putting it off once again, I'm going to "rough out" a recap of what I've been up to since 1960. Music has always been a main focus in my life. After Milby, I went to UT-Austin as a music performance major; played principal bassoon in the Austin Symphony for five years and, in the summers, performed with the American Wind Symphony in Pittsburgh, PA. During my last three years at UT, I also held a full time position in the San Antonio Symphony Orchestra. A busy schedule, but I needed the money and gained valuable experience. When my military draft number was about to come up, I auditioned and was accepted for the "the President's Own" US Marine Band in Washington, DC. During my four years in the Marine Corps, I met my wife, Marthann at the White House where she was a White House correspondent for the Ft. Worth Star Telegram and Houston Chronicle. With Marine Corps educational support, I earned a Masters Degree at the Catholic University of America, Washington. Following the Marine Corps, Marthann and I went west to Fresno, California where I had accepted a teaching position in the Music Department of California State University, Fresno, and a concurrent appointment as principal bassoonist of the Fresno Philharmonic Orchestra. Marthann became the university's Director of Publications. Our two children were born in Fresno - - Jonathan in 1972, and Hilary in 1974. In 1977 I was appointed chairman of the Music Department, a position I held until 1982 when I accepted the chairmanship of the Music Department at the University of Rhode Island. In 1985, Miami University in Oxford, Ohio, asked me to chair their Music Department. Oxford is a small university town about 20 miles from Cincinnati. We lived in Cincinnati during most of my time at Miami University. 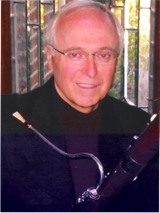 In addition to my administrative duties and my teaching, I've been very fortunate to have had wonderful opportunities for performance as a solo bassoonist, chamber musician, orchestral player, and clinician. Those opportunities have taken me to 36 countries over a span of four continents, as well as some gratifying opportunities to make numerous recordings on commercial labels. On retirement from Miami University in January, 2007, Marthann and I moved to the High Country of North Carolina, to an idyllic little village just outside the town of Boone. We love it here. Even though I am "retired", I'm still active as a performing musician and, in fact, have been enlisted this year to fill in for the ailing bassoon professor at the North Carolina School of the Arts in Winston-Salem. Marthann, too, is enjoying her new "retirement" lifestyle. We closely follow the lives of our "kids" - - Jonathan is a graphic artist in Cincinnati, and Hilary is in Manhattan where she is an executive for a leading international fashion company. With regrets over not being able to attend any of the previous Class of 1960 Reunions, I'm finally looking forward to attending the next one. Please take the time now to make a comment in response to John's biography. You will also enjoy reading the comments that others have left. I also have had a musical career. I went to Sam Houston on a voice scholarship and have taught many music classes, directed many school choirs, church choirs, and barbershop choruses in and around Houston. I still play my saxophones occasionally but the love of my life is the most enchantingly beautiful instrument-the wind controller. Everywhere I play it, people cannot believe the power and beauty of this instrument. Hope to see you, John, and other friends at our next reunion. It's been a long time since the Buff Band. I often wondered where you went and now I know! Looking forward to seeing you next spring. Good to hear from you. Have enjoyed reading your bio material and am not surprised at the wonderful career you've enjoyed. I think you could have been equally successful as a musician. I have fond memories of your fine trombone playing. Look forward to seeing you next year. I have lost contact with you and would like to know how to reach you. I am still in Oxford, Ohio. So, you can reach me there.